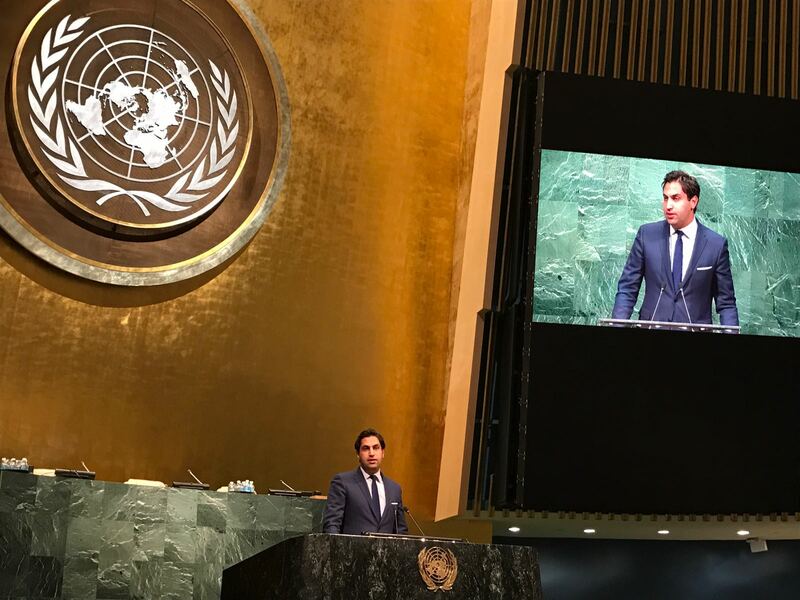 As Mr. Ahmad Alhendawi brings to a close his tenure as the first-ever Secretary-General’s Envoy on Youth, a position he held since January 2013, see below some of the highlights of his last week at the United Nations. [As Youth Envoy] I learned that governments are better off when they listen to their youth and meaningfully engage them. Countries develop when they embrace and invest in their youth’s talents. He noted that having served as the first Secretary-General’s Envoy on Youth had been an exception journey on all accounts: A journey that had taken him to over 130 countries around the world; that had allowed him to see the centrality of youth to everything the UN does, noting that the voices of youth have been critical to the development and adoption of the Sustainable Development Goals, the Paris Climate Agreement, the Security Council Resolution 2250 on Youth, Peace and Security, the advancement of human rights, gender equality and humanitarian action. 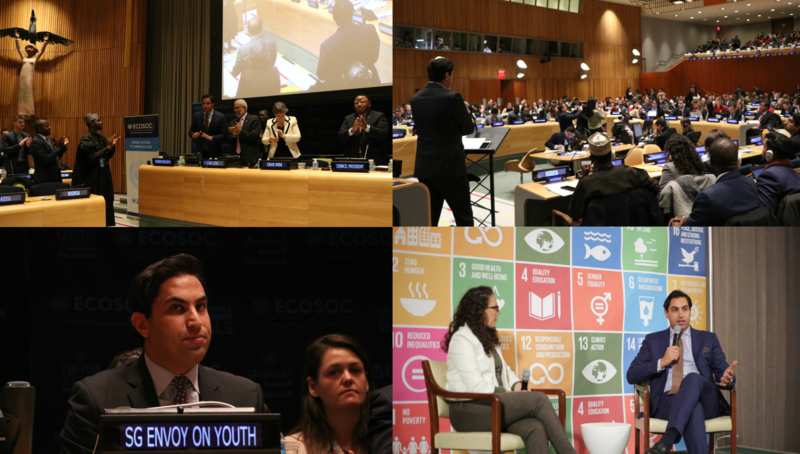 During the two-day Forum, which was co-organized by the Office of the Secretary-General’s Envoy on Youth, Mr. Alhendawi undertook numerous speaking engagements as well as also the moderation of one of the Forum’s interactive Ministerial Roundtables. Participating in the first ever SDG Media Zone held in parallel to the 2017 ECOSOC Youth Forum, Mr. Alhendawi was interviewed by Ms. Carolina Medina, the Co-Founder of Agruppa and a member of the first class of Young Leaders for the SDGs. Speaking with Ms. Medina, Mr. Alhendawi reflected on the progress of the ECOSOC Youth Forum over the past years, saying, “We’re seeing an amazing momentum happening around youth issues,” and “An increased recognition of the centrality of youth to international peace and development.” The SDG Media Zone interview allowed for the interactive online engagement of viewers from all over the world, who had a final opportunity to pose questions to the Envoy and engage with him remotely. 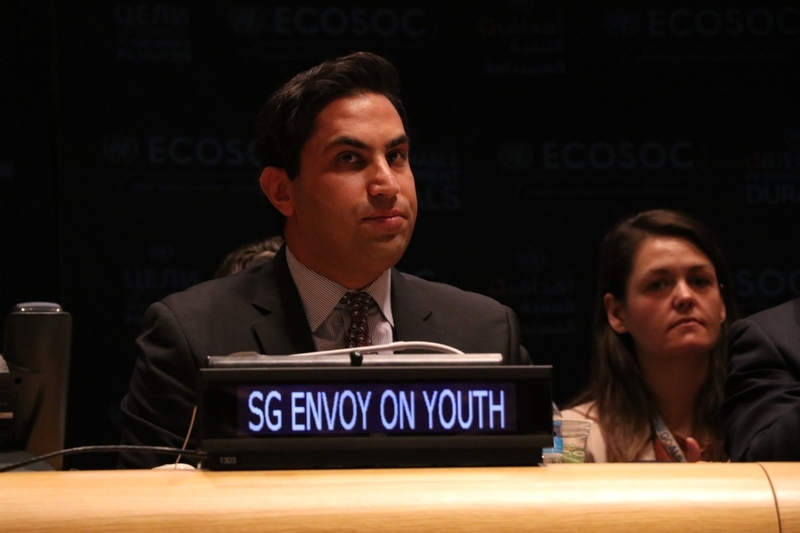 While in his opening remarks the Envoy had been looking back on his 4-year term, in his closing remarks at the ECOSOC Youth Forum, Mr. Alhendawi as the outgoing Secretary-General’s Envoy on Youth looked forward at what in his view the UN can do better to continue to advance the youth agenda. Amongst other efforts he called for a reconsideration of the now more than twenty-year old World Programme Action on Youth (WPAY), saying, “It just doesn’t speak to the realities and the needs of young people today.” Alhendawi also spoke about the “invisible goal” of youth development within the Sustainable Development Goals and the need for support of reporting on youth development related indicators. Talking about the Office of the Secretary-General’s Envoy on Youth, Alhendawi underscored the need for continued investment in supporting and strengthening existing infrastructures and the organization of youth work at the UN. Regarding the ECOSOC Youth Forum, Alhendawi called for the consideration of formalizing the meeting as a way to advance the much-needed dialogue between Member States and other stakeholders in the youth sector, to which the large and ever-growing number of participants, including Member States attending at the highest level of authority for youth and other participants attest to. 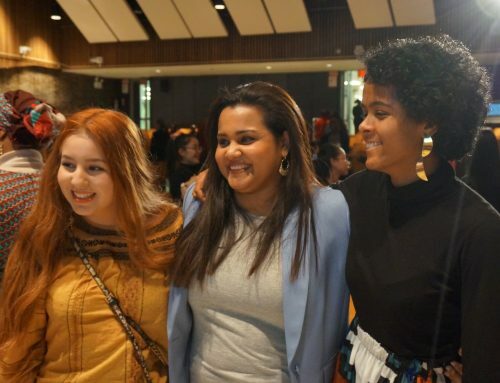 Finally, the Secretary-General’s Envoy on Youth recommended further financial investment in youth in a possible global fund for youth development and peace. Mr. Alhendawi has completed four years as the Secretary-General’s Envoy on Youth and will soon be joining the World Organization of the Scout Movement as its Secretary-General, taking up this position on 1 March 2017. Through his service, leadership and commitment, he has brought young people closer to the UN, and the UN closer to young people. He has demonstrated that young people have what it takes to be leaders in any field, including in the world of the United Nations. In his new position heading one of the largest youth organizations with over 40 Million members around the globe, Mr. Alhendawi will continue to work closely with the UN for the creation of a better future for youth. He expresses his sincere thanks for the outpouring of congratulatory wishes that followed the announcement of his departure and is wishing all success to his successor to continue supporting youth development around the world.